Figure 2. About 750 pumps and 1,700 valves destined for the modernization of the district heating system in Constanta were supplied by KSB. Figure 3. 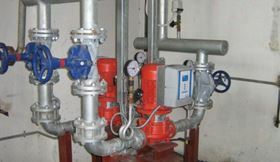 In Constanta's district heating system transfer stations, variable speed hot-water recirculation pumps ensure that heat energy is distributed to the connected residential buildings according to demand. District heating systems offer tremendous potential to reduce operating costs in heat distribution to consumer installations. 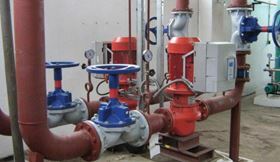 The modernization of the district heating system in Constanta, Romania primarily involved replacing hot-water recirculation pumps and setting up an automation system, which allows 132 district heating transfer stations to be monitored from a central control station. The recirculation pumps used are fitted with demand-based speed control systems. So far, the experience of the RADET district heating system company has been that the energy costs saved through demand-based heat distribution and reduced pump power input mean that investments made in improving the quality of supply more than pay for themselves. District heating plays a key role in supplying energy in Eastern European countries, providing residential buildings with thermal heat and hot water. In some large cities, district heating covers more than 60% of space heating. However, existing district heating systems need large-scale modernization. Indeed, heat losses of 20 – 30% are quite common, arising solely from outdated distribution grids. The amount of energy that district heating companies have to make available in combined heat and power (CHP) stations is correspondingly high. Further energy losses result from a failure to match distribution of hot water with the constantly fluctuating heat requirements of the connected buildings. Outdated recirculation pumps operate in transfer stations with fixed rotational speeds at reduced efficiency. This results, in turn, in high thermal energy consumption (for the transport of the heat transfer medium), as well as high pump motor electricity consumption. The large district heating system in Constanta provides an example of a city's energy supply falling short of modern requirements for reliability and energy efficiency. The city has around 200,000 inhabitants, all of whom need heating and hot water. The old system, around 30 years old, was the root cause of increasingly frequent breakdowns, as well as high energy costs and rising outlay for upkeep. The operator, local energy supply company Regia Autonoma de Distribuire a Energiei Termice (RADET), invested heavily in the modernisation of 132 district heating transfer stations and two power plants to supply around 87,000 homes in this Black Sea town. In addition to the transfer stations operated by RADET, there are another 72 supply units for industrial plants and other heat consumers. The modernisation work, ongoing since 2006, is part of the continuous ‘Local strategy for central thermal energy supply’ development concept for heat supply in Constanta. The programme of investment includes replacing hot-water recirculation pumps, renewing electrical and monitoring systems, plus building an automatic monitoring and management system for the district heating transfer stations. Fundamental is the replacement of recirculation pumps with energy-efficient variable speed pumps for automatic performance adjustment. Currently, around 80% of the transfer stations now have the new recirculation pumps. The supply network distributes 120,000 kg of hot water/hour to the transfer stations at around 12 bar pressure via insulated pipes. The 136km long district heating network transports thermal heat to the connected residential buildings for use in space and water heating. The thermal heat is produced in a power station near the city that provides a thermal output of 2 × 50 MW from its primary energy sources of oil and gas. Following the stage-by-stage refurbishment of the district heating transfer stations, variable speed pumps ensure that heat energy is used far more efficiently than used to be the case. 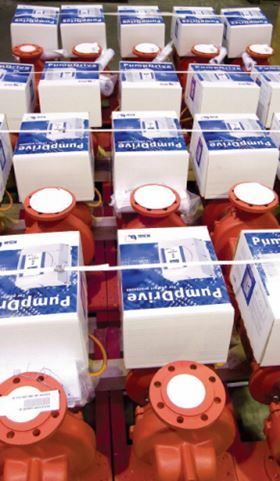 Between December 2005 and February 2007, German pump manufacturer KSB delivered 750 Etaline hot-water recirculation pumps to Constanta – equipped with KSB's PumpDrive variable speed system. These were destined for 102 of the total 132 transfer stations that have – so far – been modernized. The speed control system continuously matches the pump output to the fluctuating requirement for thermal heat. In this way, during periods of low flow, only the output actually required at that time is pumped through the connected heating system. The PumpDrive variable speed system allows precise and continuously variable control of the motor speed to match current demand. As PumpDrive is suitable for use with any motor brand, it can be mounted to all electric motors used in pumping systems to optimize their operation. Demand variations are detected using a sensor, and the pump's output is matched accordingly through immediate frequency adjustment. As the flow rate decreases, PumpDrive registers a rise in pressure, calculates the required pump output as a function of the set pressure, and reduces the speed accordingly. When consumption starts to increase again, the pump control system responds to the resulting drop in pressure by increasing the pump output. The speed control system can be set to consider the conditions at the worst point in the system. To manage the different power requirements, the control unit takes into account friction losses in the piping between the pump and consumer installation as if the differential pressure were being measured directly at the consumer installation itself. This also supports energy-efficient operation. For each period of low flow operation, the pump only produces the flow pressure required to compensate for the friction losses in the piping towards the consumer installation. Depending on the application, the power consumption of the drive can be reduced by up to 60%. In addition, output-based, continuously variable speed control ensures that the pump can be started smoothly. It also reduces the number of starts and stops. The result is the extension of the pump's service life, which is beneficial for life cycle costs. The variable speed system allows pump variables, such as actual flow rate and speed values, to be checked. This allows operating and maintenance staff to take readings of the pump parameters directly in the transfer stations and to adjust these where necessary. It is also possible to keep an eye on pump operation from a central control station. In the course of modernisation, a networked IT communication system for data collection, transmission and storage was set up. This can be used to monitor the processes in the supply system in real time. Remote monitoring of current equipment and instrument operating conditions is via Ethernet connections from the transfer station computers. Heat and water meter consumption data is centrally collected and evaluated via an M-Bus communication interface. In addition, a fibre-optic TCP/ICP data communication system between transfer stations allows maintenance staff to control pump operations in other stations from a transfer station. For safety, however, parameter changes are only possible from the central control station. In addition, the whole data communication and management system compiles analyses such as comparisons of actual values and setpoints, as well as a data history. Energy-efficient operation means that thermal energy is used more effectively and that the power requirement of pump drives is reduced, so cutting operating costs. The savings enabled higher investments to be made to further improve supply reliability. The district heating transfer stations are provided with two pumps, installed in parallel, for each heating circuit. This means that redundancy is ensured for the entire district heating system, so as to minimize downtime, or any other interruptions as a result of repair work. During the modernization work, all the companies involved – a consortium comprising SC Rombi SA, SC Petroconst SA and SC Siemens Romania – were in close contact with KSB. A member of KSB staff was there to oversee the on-site installation work, ensuring that the pumps with their appropriate outputs are correctly assigned to the respective transfer stations. The staff member also ensures that the differential pressure sensors for the speed control systems are correctly positioned. The installation work to replace pumps was completed with an average interruption in heat supply of between 10 – 14 hours and, for this reason, was mainly performed during the summer months. 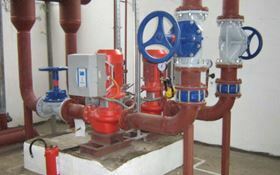 The integration of the pumps controls into the automation system took place at the same time as the installation of the hot water pumps. According to information from RADET, the conversion work took about two weeks/transfer station, including the necessary refurbishing work on the piping and the installation of various components such as insulating parts, drainage equipment, pressure gauges and shut-off valves. Refurbishing work included the renewal of a total of 1,200 KSB diaphragm shut-off valves used in hot-water supply.